Reports of around thirty workers being burnt to death and at least a hundred injured in a fire in a Bangladesh garment factory were hardly headline news here as the popular press focussed on stories about the weather in the run-up to Christmas. In truth it doesn't matter what time of the year such incidents occur - and they occur with monotonous regularity - they would receive the same cursory treatment as most other workplace 'accidents' anywhere in the world. (The media spectacle of last year's Chilean mine workers' rescue being a paper-selling/t.v. ratings boost exception.) The fact that this latest tragic and preventable fire received what attention it did - mainly the business pages of the upmarket press and certain parts of the internet - is largely due to the efforts of a growing band of groups campaigning to reform the worst aspects of the globalisation of capitalist production. From War on Want, through the Ethical Trading Initiative, Labour Behind the Label, the Clean Clothes Campaign and many more so-called non-governmental organisations (NGOs), the big US and European retail chains who look to the Bangladesh RMG (ready made garment) sector for their designer label supplies or the likes of Asda and Tesco scouring the world in order to undercut each other's prices, are hardly unaware of the conditions of the workers in the factories which provide them with such a profitable trade. For decades now these kind of reformist bodies have been threatening to embarrass the likes of GAP and Marks and Spencer with bad publicity and a potential consumer boycott if the wages and conditions in the factories where they do their 'outsourcing' don't meet certain, extremely minimal, international standards. (e.g. Employment of child labour, right to breaks, payment of local minimum wage). For example the Ethical Trading Initiative, an alliance of various campaign groups and trades unions, invites big name companies in the UK to assert they can comply with the following check list to prove, presumably, they are 'ethical traders'. It's easy enough for firms to sign up and even to make a show of doing their own occasional monitoring of certain well-chosen factories (and ignoring the bulk of the places they buy from). As it is, GAP - whose own set of rules includes clearly marked, unblocked fire exits - was supposed to have checked the Hameem factory earlier in 2010. Workers keep dying while the brands, the government and the employers drag their feet and try to shift responsibility upon each other. We've warned the brands repeatedly that this would keep happening again and again, but they've chosen to respond only in a minimal fashion (1). in February and March of 2006, 100 workers were killed from fires and collapses of poorly constructed factory buildings (2). According to the Bangladesh Fire Service and Civil Defence Department 414 garment workers were killed in 213 factory fires between 2006 and 2009. But the frequency of factory fires is not an isolated issue. It is symptomatic of the naked disregard for the lives of the people whose labour the Bangladesh capitalist class, including the government and the military, regard as nothing but a source of profit. Despite all the campaigning, it is evident that the life of textile workers and most other wage workers in Bangladesh is one of a basic struggle to survive. It is primarily a collective struggle against the ruthless exploitation of the combined forces of a local class of myopic factory owners whose only bargaining chip in their struggle to win orders from the big chain retailers in the USA and Europe is 'cheap labour', and an equally ruthless set of factory managers of directlyowned foreign companies (such as South Korean Young One Group with eleven factories in Chittagong) which is just as ready to exploit that extremely cheap labour. (3) Cheap labour is the reason why the garment sector in Bangladesh today employs around 3 million workers (mainly female) in 5,000 factories. On the backs of the cheapest labour power in the world Bangladesh is now the third largest garment exporter after China and Turkey and 'ready made garments' account for 75- 80 per cent of the country's exports. Moreover, for the last couple of years or so business has been booming as, in the words of the Financial Times, Bangladesh "has emerged as a popular low-cost alternative to China for garment production". (4) As China's supply of rural migrant labourers prepared to work for rock bottom wages begins to dry up and workers in the coastal cities fight for higher wages roving global capital is on the look-out for alternative sources of cheap labour. And it is finding it elsewhere in south and south-east Asia - in India, Cambodia, Vietnam and, despite "problems with worker unrest and strikes over poor pay and conditions" (the words are from a recent document of the Bangladesh Garments Manufacturers and Exporters Association (BGMEA, of which more below), especially in Bangladesh. Apparel exports from Bangladesh jumped 15.4% in the fiscal year to 30 June, as buyers in the US and EU turned to the country for its low-priced garments. In the four months from July to October, the country's garment exports jumped almost two-fifths to $6.8bn. From all this good fortune for the bosses there has been no trickle-down effect for the workers who have been faced with plummeting living standards as the value of their meagre wages is eroded by inflation. At the same time the bosses, far from easing their working conditions, are doing their utmost to keep down the value of labour power (wages) and extend the amount of working time in a day that goes to producing value above that amount (profit). What is a working day? What is the length of time during which capital may consume the labour power whose daily value it buys? How far may the working day be extended beyond the working time necessary for the reproduction of labour power itself?' It has been seen that to these questions capital replies: the working day contains the full 24 hours, with the deduction of the few hours of repose without which labour power absolutely refuses its services again. ... But in its blind unrestrainable passion, its were-wolf hunger for surplus labour, capital oversteps not only the moral, but even the merely physical maximum bounds of the working day. It usurps the time for growth, development, and healthy maintenance of the body. It steals the time required for the consumption of fresh air and sunlight. It haggles over a meal time incorporating it where possible with the process of production itself, so that food is given to the labourer as to a mere means of production, as coal is supplied to the boiler, grease and oil to the machinery. It reduces the sound sleep needed for the restoration, reparation, refreshment of the bodily powers to just so many hours of torpor as the revival of an organism, absolutely exhausted, renders essential. ... Capital cares nothing for the length of labour power. All that concerns it is simply and solely the maximum of labour power that can be rendered fluent in a working day. On Thursday 25th February 22 workers died in a fire at the Garib and Garib sweater factory in the southern district of Gazipur, Bangladesh, where clothes were made for high street brand H&M. The fire started at 8.45pm, probably as an electrical short-circuit on the second floor of the seven-storey building, and quickly spread to other floors containing inflammable materials. A large stock of synthetic acrylic sweaters burned and gave off a thick toxic smoke. (Acrylic fibres contain the polycrylonitrile group of vinyl compounds, which may be carcinogenic.) At least 20 other workers were injured in the blaze, many with serious burns. As is usual in garment factories, the exit doors were kept locked by the bosses to prevent theft, as were internal doors. When we last wrote about Bangladesh hundreds of thousands of textile workers were joined by tens of thousands more workers in raging class struggle involving direct battles with the army and police of almost insurrectionary proportions. This, despite the fact that the textile owners were cutting wages, laying-off workers and extending working hours of the rest in the face of declining orders as a result of the WTO’s ending of the Multifibre Tariff Agreement. (Which resulted in more orders going to China.) In 2006 the workers fought to get the government to increase the minimum wage which had not changed for twelve years and whose real value had halved. They then had to fight to get the bosses to pay it! Even so its real value was still well below the 1994 level and by the middle of last year, with food price inflation rising, this legal minimum was worth not much more than $20 per month. Not surprisingly the number of people in Bangladesh who exist on less than $1 a day has also increased. Nowadays the estimate of how many of the now 160 or so million population are trying to survive on less than $1 ranges from 40-50 per cent. Nobody really knows. What we do know is that throughout last year the working class in Bangladesh - textile workers in the van - battled again, first to get the government to agree WTO increase the minimum wage and second to force the bosses to implement it. It took until April for a wages board to be set up where government, bosses and ‘workers representatives’ haggled over what the new minimum should be. The outcome was an agreement in July to raise the minimum to 3,000 taka, the equivalent of $43 per month. More than 50,000 garment workers went on the rampage in Ashulia in June 2010, forcing closure of at least 100 factories ... amid deep concern of investors. 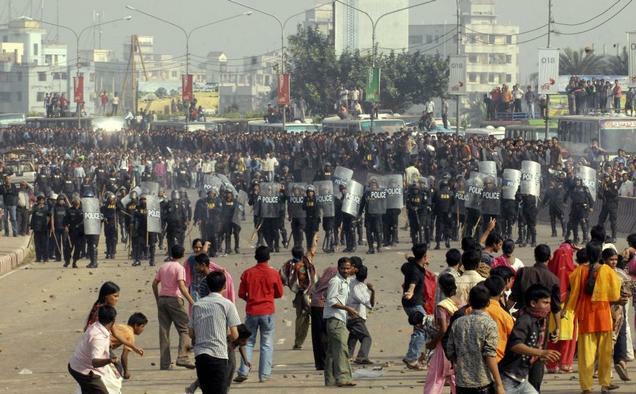 The workers demonstrating for a pay hike ransacked at least 37 factories and damaged 25 vehicles on Dhaka-Tangail highway on June19 2010. They are demanding Tk.5000 as minimum wage. Police fired 65 rounds of rubber bullets and 14 teargas shells to break up the demonstration. They also used water cannon as several thousand workers threw brick chips at them. Many of the garment workers and 10 policemen had to be taken to hospitals and clinics in Savar and Dhaka... The unrest spread to the Hameem Group, which employs 26,000 where the workers were allegedly mistreated by management. The labourers held protests and then walked off the factory. Soon tens of thousands of workers joined the protesters after the owners of at least 100 factories suspended production and declared holiday (sic) for the day fearing largescale violence. The workers spilled on the narrow highway linking the capital Dhaka with the northern districts, turning the area into a human sea stretching miles from Ashulia to Baipail in Savar. “There were tens of thousands of workers, protesting maltreatment of their colleagues and demanding minimum salaries of 5,000 taka”, Ashulia police chief Sirajul Islam said. It is a reformist myth that capitalism, which depends on profits generated by appropriating the surplus labour of wage workers, can be gently pushed into becoming a benign system which benefits all. Whatever workers in Bangladesh wring back from capital they do from their own hard and bitterly fought struggles and for the most part outside of the confines of trade unionism. Only about one percent of Bangladeshi workers belong to unions. In the textile sector when unions do exist they are often sponsored by Western campaign groups who, at the end of the day, are seeking to establish a modus vivendi between labour and capital on the basis that capital pays its source of surplus value a living wage. improve the quality of products made in its member factories - in a move that could also enable firms to seize a larger share of the global market (6). the sum of the expenses for the reproduction of labour power … just as in a machine the part of its value to be reproduced every day is greater the more rapidly the machine is worn out. The establishment of a normal working day is the result of centuries of struggle between capitalist and labourer. [And that...] In place of the pompous catalogue of the ‘inalienable rights of man’ comes the modest Magna Charta of a legally limited working day, which shall make clear ‘when the time which the worker sells is ended, and when his own begins (7). However, the position of Bangladeshi workers in the second decade of the 21st century is not the same as English textile workers in the early 19th century. Today workers everywhere face an over-mature, globalised capitalism that is in the throes of a long running, increasingly severe crisis which, far from allowing workers in places like Bangladesh something approaching a ‘normal working day’, the prospect is - as our comment on Tunisia puts it - ‘take it or leave it’ and the Western retailers will look elsewhere. As it is, even the elusive 5,000 taka that workers have been demanding would not be anywhere near enough to provide a living wage. The inveterate reformists of Label Behind the Label have come up with the idea of campaigning for an Asian ‘floor wage’ which would be enough to pay for food, water, clothing, housing, taxes, utilities, healthcare and education. In the case of Bangladesh this would require a minimum wage of more than 10,000 taka, something which the group’s spokesman at least admits “At the moment (it) seems well out of our reach”. As it is, the situation of the working class is so bad in Bangladesh that the government has been obliged to resort to distributing subsidised rice tokens to over one million of the poorest section of the population as inflation, especially the cost of food staples, mounts. We might add that in the heartlands of imperialism the boundaries of what were once accepted by capital with the so-called post-2nd world war settlement are being steadily dismantled in the face of the capitalist crisis. In any case there is nothing historically progressive about the present proletarianisation of rural migrant labour in Bangladesh. It is unnecessary for the horrendous conditions of the working class in places like Dhaka and Chittagong, which are reminiscent of Engels’ description of the English working class at the outset of the industrial revolution, to be repeated today when the material conditions for a higher mode of production and form of social relations have existed for arguably a century. The recent globalisation of modern capitalism is part of its response to the inbuilt recurrent crisis of declining rate of profit. The textile workers in Bangladesh, and many others like them the world over, are both the offspring and the victims of this essentially imperialist integument. In the long run the only way this can be dismembered is by workers world wide joining together in a political struggle, not to demand a fair day’s pay but for the abolition of the wages system. 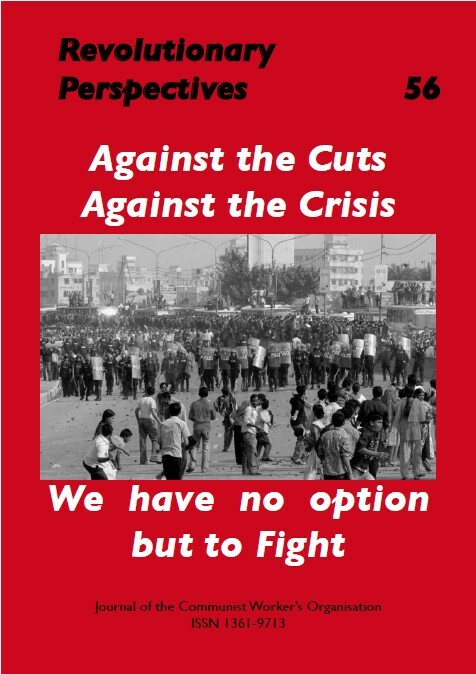 (2) 'Garment Workers Struggle Against Vicious Exploitation' in Revolutionary Perspectives 41. (3) According to a World Bank report of 2005 (Foreign Ownership and Firm Productivity in Bangladesh Garment Sector by Hiau Looi Kee), most of the garment firms in Bangladesh are locally owned. Foreign firms operate in the export processing zones (EPZs) in Dhaka and Chittagong where more than 63% of firms have some foreign ownership, from countries such as South Korea and Hong Kong. (4) From the FT report on the Hameem factory fire ('Brands in Safety Push After Bangladesh Fire') significantly published in the Commodities and Markets section of the paper. (5) Report by the Bangladesh Garments Manufacturers and Exporters Association (BGMEA) 2009; just-style.com. (6) From the BGMEA report cited above, explaining the plan to implement a Quality Improvement Program (QIP) in twenty factories - with German technical support - and with an eye to increasing global market share. (7) This and all other quotes from Marx are from Section V of chapter 10, 'The Working Day' in Marx's Capital Volume 1 (Lawrence and Whishart ed.) p252ff.